Every session book with Junk King will be staffed by at least two very capable movers. This is the team is going to do all the work for you. The only effort you put into this task is point to what you want removed. Junk King wants to make sure that everything you want taken away is gone in a single session. However, that doesn’t mean you only need to hire Junk King one time. You could use them to help clear out the garage one weekend and bring them back for yard waste cleanup the next. It is totally up to you. 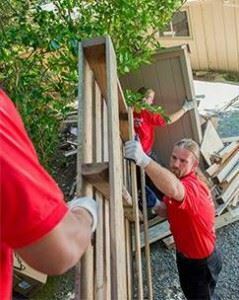 Even though you may be scheduling your junk removal session online, you can count on a fast response. Most sessions are completed within 24 hours of that first contact. There also same day pickup appointments available depending upon the schedule. Junk King understands how valuable your time is and doesn’t want to waste a minute of it. They like to move fast and that means getting in and getting out with your junk as quickly as possible. Junk King prides itself on challenging removals. Whether it’s a piano or pool table, they have the experience and the lifting know how to get something safely out of your home and onto the truck. When you have junk that needs hauling the only call to make is to Junk King Boston. This entry was posted in Boston Junk Removal, junk removal and tagged Junk King, junk removal, reviews on September 25, 2017 by Junk King. Last updated September 25, 2017 .